Exciting News!!! Announcing The Camp Echo Lake Theatre Shows for 2017! Greetings to our Camp Echo Lake Families, old and new! We, the theatre staff, hope you have had an amazing year thus far and we are excited to officially announce our shows for the 72nd season of the CEL Players! UPPER INTERS it’s time to bring some of the most classic comic book characters to life! 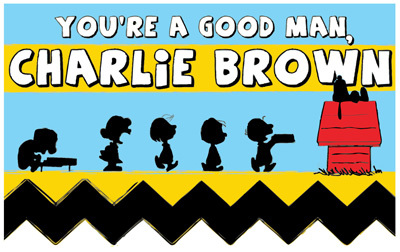 This summer we will be bring Charlie Brown and the gang to life in You’re a Goodman Charlie Brown! This heart-warming musical follows our favorite Blockhead, Charlie Brown, and his friends as they find out what happiness really is as they sing classics such as “My New Philosophy”, “My Blanket and Me” and “Suppertime”! This show has something for everyone. FROSH get ready to take rock camp with School House Rock! Time to teach some valuable lessons to your fellow campers with classic rock songs that will have the whole camp talking! Come ready to rock this summer…we can’t wait to see you up on stage showing the whole camp what you got! Hey JUNIORS you guys are the sweetest kids at camp! This summer your sweet tooth will be singing in Charlie and the Chocolate Factory! This famous movie turned musical is going to be one for the ages! With songs such as “The Candy Man Can” and “I’ve Got a Golden Ticket” the whole camp will want some of the sweet magic you bring to the stage! LOWER INTERS! Get ready to travel across land and sea in Disney’s The Little Mermaid! Go along with Ariel as she finds a way to win her true love Prince Eric with the help of her friends Sebastian and Flounder! Classic songs such as “Under the Sea” and “Kiss the Girl” are sure to get camp singing along and having a great time! Hey SENIOR VILLAGE AND LITs…we’ve got magic to do! This summer we will be going on the classic adventure with PIPPIN! This classic tale follows our hero, Pippin, as he goes on a major adventure to find pure happiness and love, or as he likes to call it, his “Corner of the Sky”! This Tony Award winning musical will be sure to have camp in awe! So, get ready, because we have parts to perform and hearts to warm this summer! There ya go, folks! We have a very exciting and challenging season lined up for CEL Theatre 2017! With a diverse group of musicals and talented campers, this season is going to be one for the ages! We are excited to work with everyone! Ryan Mahannah (Theatre Head Specialist ) and the 2017 Theatre Staff!